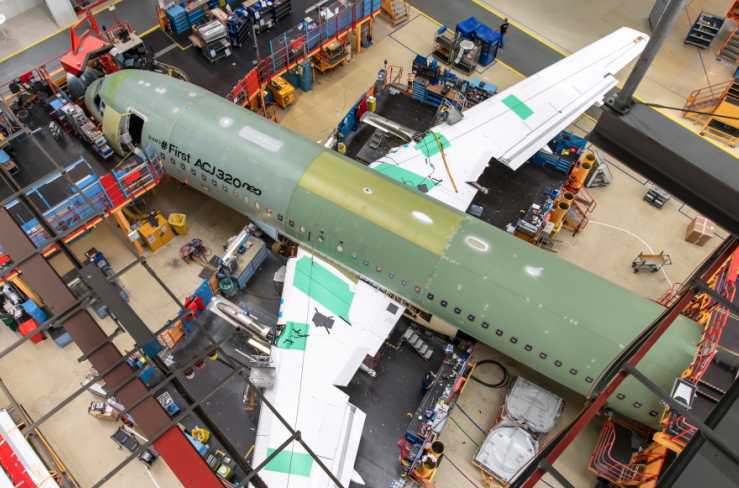 27th June 2018 – The first ACJ320neo has entered final assembly in Hamburg, marking the start of a new era in Airbus corporate jets. Featuring the largest cabin in its class, the ACJ320neo is due to be delivered to Acropolis Aviation of the UK in the last quarter, together with a second aircraft, for Comlux of Switzerland. More than 300 A320neo Family airliners are already flying with carriers around the world, but deliveries of corporate jet versions are only just beginning. Like the airliner versions, the ACJ320neo Family features new-generation engines and Sharklets, which save around 15 per cent in fuel and deliver a leap forward in range. The resulting ACJ320neo can fly 25 passengers 6,000 nm/11,100 km or 13 hours - enabling routes such as London to Beijing or Cape Town and Moscow to Los Angeles - while the ACJ319neo can fly eight passengers 6,700 nm/12,500 km or 15 hours. The hallmark of the ACJ320neo Family is a wider and taller cabin than that of traditional business jets, while having a similar ramp-footprint and operating costs and better residual value. ACJ320neo Family differences from airliner variants include a cargo-hold that is reinforced to carry additional centre tanks (ACTs) for intercontinental range, built-in airstairs for airport autonomy, and a lower cabin-altitude for passenger comfort. Orders for the ACJ320neo Family now total nine aircraft, comprising three ACJ319neo and six ACJ320neo aircraft. Airbus Corporate Jets (ACJ) creates the world’s most rewarding flying experiences for customers by providing them with unique expertise, the finest service, best technology and highest standards of care in corporate aviation. All Airbus corporate jets come from the most modern aircraft family on the market, derived from Airbus’ successful market-leading jetliners. © Chic and Style Limited 2000 - 18. All rights reserved.